“My work with my dad has developed naturally over the years,” says Jordan. 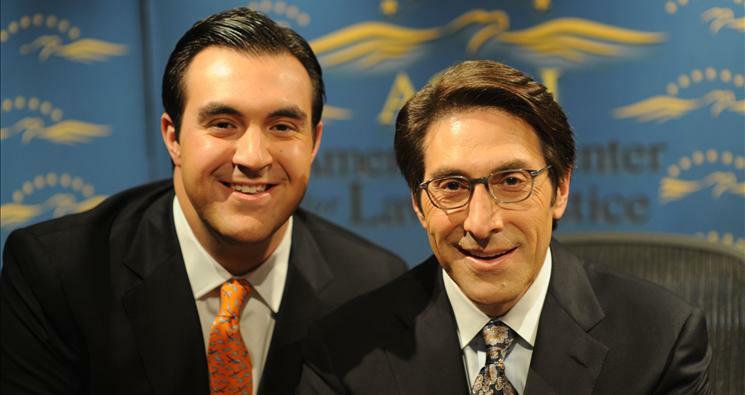 “On radio, I started co-hosting with him, and then filling in as host… between the two of us, the program can almost always be live.” Today, Jordan oversees the ACLJ’s international operations, hosts the Jordan Sekulow Show, and co-hosts the Jay Sekulow Live! radio program and the ACLJ This Week television broadcast with his father. He frequently travels overseas to engage in high-level legal and policy discussions with government officials and also provides national political analysis for U.S. media outlets. Jordan and his dad agree that it was a natural fit for him to get involved with the organization. “I’ve never had a fear of public speaking, because I’ve been exposed to it all my life,” says Jordan. “I always thought the cameras and a crowd was the norm.” Jordan says that most importantly, he cares about the issues just as much as my dad. “From a young age, he instilled in me the importance of what was at stake, and the power of a single person standing up when they were wronged. My dad was the lawyer ready to help them when they took that stand.” he says. “My dad took my brother Logan and me to as many of his activities as possible… and as he became more well-known, we met more influential people.” These hands-on experiences are what Jordan credits with the confidence he has today, making him comfortable leading meetings with high-ranking government officials – such as his recent visit with the Vice President of Brazil. “While I enjoy taking on more leadership responsibilities, I’m also more than happy to take a back seat to my dad whenever we are together,” said Jordan. “Many opportunities we have are in places and with people neither of us would imagine… I keep learning from my dad and plan to for years to come, as I want to be as effective as possible in my role.” Jordan’s brother Logan, 26, is also involved with ACLJ and helps direct their media and production initiatives. RM: What is the most important lesson you have learned from your dad? JS: I have learned so much from my dad. I grew up watching him prepare for court cases and interviews, and he involved us in the ACLJ from a very young age. Perhaps the biggest thing I’ve learned from my dad is how to be prepared at all times… whether it’s for a big court case or a hostile media interview. My dad always says “Stick to your points, focus on what you are there to get across, and try not to get sidetracked.” We are often trying to communicate complicated legal cases or explain laws, and it’s important to keep going to back to the 3 core points you want people to take away – from interviews, from our radio shows, from meetings, and from court. RM: What is one thing you think people would be surprised to learn about your dad? JS: I think people would be surprised to learn that my dad did not plan on doing this his whole life. He did not grow up in the legal or political world. He worked hard as a kid, worked in retail through college – like his father – and made it to law school. He started his career as a tax attorney. He followed God, took an opportunity presented to him – an offer to argue a case at the U.S. Supreme Court – and learned the process of practicing constitutional law along the way. My dad argued his first Supreme Court case in 1987, Board of Airport Commissioners v. Jews for Jesus, and a news reporter described his oral argument style as “rude, aggressive and obnoxious.” But he won that case 9-0, and it was a big victory for free speech and religious liberty. That experience opened his eyes to what was happening to our country in the courts, and he grew tremendously as a result. From that point forward, cases started flooding in and he has stayed busy ever since… a powerful example of following and trusting God! RM: Your dad seems so intense on television and radio. Can you share any fun anecdotes that shed light on his personality? My dad is very funny and he tries to keep things light. Everything we work on at ACLJ is serious… we are constantly dealing with tough issues and significant cases, so people think my dad must be in a suit all the time, always focused on work with the same intensity they see or hear in the media. While he is intense about work and can sometimes be intimidating, he knows how to make people feel comfortable. My dad has taught us that it’s important to keep things perspective… you must work hard and get everything done on time, but you can’t always go around with the same intensity that you have on television or radio. A fun example is that my dad enjoys sports and adventures… I’ve learned to play tennis from him, and we enjoy playing golf together. This is humorous, especially since everyone in our family loves to talk: one thing only the three of us do – my dad, my brother Logan, and me – is scuba diving. Just imagine – we’re out on a boat talking the whole time on the ride out to the dive site, and then for two periods of 45 minutes each dive, we aren’t able to talk – something none of us are used to! Quickly after coming up from the dive – with our heads bobbing in the water – the talking starts up again. My dad is the only person I know that can be on a conference call, turn the speakerphone on, put the BlackBerry down beside him, tee up and smash a drive in to the fairway, all while continuing the conversation. It amazes me and everyone else who has a chance to play a round of golf with him! RM: Any memorable reactions from encounters when people have realized you are Jay Sekulow’s son? JS: I often represent my dad and the ACLJ at meetings and events, and what people appreciate most is the hard work he does behind the scenes and the way he has personally reached out and helped them. People often tell me, “Your dad is the hardest working person I know.” Our job is to help and it really is astonishing to me to see the amount of people he has assisted during his career. He’s grateful to help because we’ve been blessed with the ability and resources to do so. The amount of work my dad does that people don’t see is amazing – he is often working on 15-16 issues at a time, and the fight for free speech and religious liberty is very personal to him. My dad’s grandfather came to America as a child – a Jewish immigrant from Russia fleeing religious persecution. Now, his grandson has opened an office in Russia to defend religious freedom rights and his great-grandson is overseeing the work there. RM: Any encouragement or advice you can offer fathers and sons as we approach Father’s Day? JS: For me, there is nothing better than being able to work with my dad every day. But, I know that isn’t God’s plan for everyone. Fathers, trust God and be a great example for your sons. Even if I didn’t work with my dad, the example he set in his personal and public life – as my dad and as a husband, a brother, and a son – is a major part of the reason I am who I am today. Inspire them, encourage them, and guide them. Do everything you can to instill the right values and a strong faith that can carry them through even the toughest times. Sons, appreciate what you can learn from your dad every day, in personal life and in the career world. Be thankful that you have a loving father, trust God, and always be open to the advice of your dad – even if you think he doesn’t understand you, most likely he does. He’s experienced the same sort of situations and a whole lot more. Listen carefully, as there is a lot of wisdom being offered to you. Most importantly, love each other!